Louisa Heyer of Stoutsville, Ohio, won first place in the adult category Friday in the sidewalk chalk art contest sponsored by KFC. She is shown working on the portrait that judges deemed the top entry. In second place was Terri Elam for an eagle design, and in third place was Shelby Dodds for an abstract Nintendo Mario picture. Proceeds from the event benefit SATH. 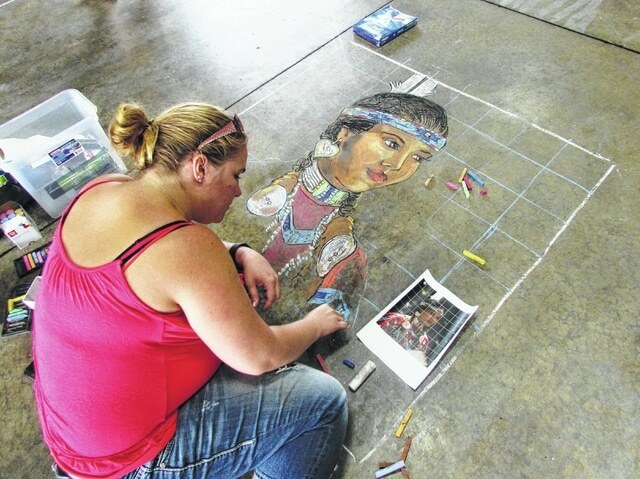 Louisa Heyer of Stoutsville, Ohio, won first place Friday in the sidewalk chalk art contest sponsored by KFC. She is shown working on the portrait that judges deemed the top entry. In second place was Terri Elam for an eagle design, and in third place was Shelby Dodds for an abstract Nintendo Mario picture. Proceeds from the event benefit SATH.